Since my recent website update, I have been experimenting with different themes. Lots of redecorating. I’m sure I’ll change it and change it back a few more times before the year ends! It’s fun. I ❤ wordpress.com! What do you think of the place? I had a snow day today, which consisted mainly of snow-blowing the driveway (twice so far – I think I’ll go out there again in a couple hours). I also cleaned the house. I had every intention of doing more art career stuff but got sidetracked by a couple hours of pilates and sit-ups, as well as flopping around reading fashion magazines and perusing Facebook then finally uploading the last pictures of my students’ artwork for Scholastics. The regional deadline for the Scholastic Art Awards is right around the beginning of Christmas vacation. Artwork is judged via JPEGs the first week of January. I’m entering ten pieces this year. 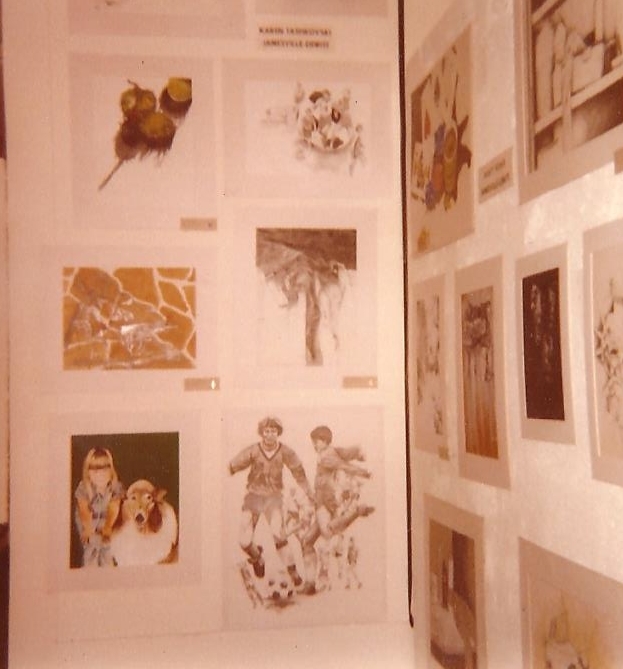 For me, winning those awards as a student was more or less the springboard into this art journey. I had been getting only packets for engineering colleges in the mail during my junior year in high school because I was in accelerated math classes. All of my classmates are now CEOs of major companies or prestigious doctors, but no matter. I still can’t tell you what an engineer does, lol. I won a blue ribbon for my senior portfolio and three awards for my three individual entries – two more blue ribbons and a gold key. And that sealed the deal for me. I thought it meant something, like a sign that art was the right direction for me. I shouldn’t say it like that. I didn’t pick art on a whim or because of some dumb magical thinking scenario. I knew it was the right thing for me. I think we’ve had this conversation before. My students’ art is way better than this stuff but they don’t always win. Competition these days has been taken to an otherworldly level and it will always be disappointing to at least one someone who is uber-talented. There’s no way around that. But the dreams are very much alive and the excitement is building! This theme is clean and crips, Karen. I think it fits your style well. Thanks, Mark. I think it’s called Blogfly. I’d prefer to have all of the menu stuff on the right side instead of the left. I loved the way The Writer theme looked, but I couldn’t access the menu from a PC laptop. At least I couldn’t figure it out. It worked on a Mac though when I checked it at school. There are so many new themes that WordPress is unveiling, Karen. I’m tempted to try some myself, but I am such a creature of habit, and I know I like the way my blog looks now. Coming up on two years of blogging, and I’ve only had two themes. How boring am I? I really don’t think we choose art…it’s there all along. It’s not a career. It’s our being. I had to fight to go to art school. Everyone thought I should go into math, too. I was lucky to have supportive parents. Thanks, Mom & Dad! Thanks for commenting, Jan! And ditto to supportive parents.